I have struggled with negative thinking - towards myself - for many years - since about the age of 7, actually; I am now 49. I find it difficult to accept a compliment, but receive an insult directly to my heart with great ease. But no one has ever put me down, or damned me, or constantly berated me as much I have. A few nights ago, I got to a point where I was fed up with putting myself down, and as I said, "I've had enough of this!" and started speaking Biblical truth against the negative thoughts - such as "I am the righteousness of God in Christ Jesus", along with "God loves me and my children love me, so that's good enough for me", God placed on my heart, "Abandon yourself to grace." Abandon: deliver, give up, indulge, surrender, yield, desert, forsake, maroon, quit yourself... And give yourself over to grace. Let grace rule in your heart, in your soul, in your mind, in your life - in every moment of your every day! Grace: (In Christian belief) the free and unmerited favour of God, as manifested in the salvation of sinners and the bestowal of blessings. When I chose to be a follower of Jesus Christ, at the age of 26, I found myself quite comfortable in the boundaries of legalism (the Law given through Moses), but then God made it clear to me He wanted me free of legalism and living in the grace (undeserved favour and freedom) that comes through Jesus Christ. But grace was scary for me. At least with legalism you knew the rules and could work at sticking to them. Grace gave me way too much freedom and space to mess up in... Then I messed up, ;) and God continually worked to help me accept grace. He's still working on helping me accept it with all my heart. Hence the reason I'm adding this section to my website. For the past 5 years or so, I've been slipping backwards on my spiritual walk. Or backsliding (relapse into bad ways or error), as some would say. I still loved God, I still believed in Jesus, and spoke to Them daily, and I still saw and felt God's love and grace all the way. But when I went to Him the other week, in prayer, asking Him to help me get my heart sorted out, I found it difficult to welcome complete forgiveness again. EVEN THOUGH I KNEW God's grace, and I KNOW what the Bible says about forgiveness - that our loving Father is willing to forgive and casts our sins from us as far as the east is from the west as soon as we repent of them - but I still couldn't feel the freedom He offers, through Jesus, through mercy and grace, in my heart. A few days ago (which I recently blogged about), God pointed out that He'd forgiven me for the first 20 years or so of my backsliding so why wouldn't He forgive me these 5 years? That opened my eyes and heart to a greater measure of His grace - and love! You see, I fell in love with God and Jesus at Sunday School, when I was about 7 years old, but, as an adult, I would claim that I became a Christian when I was 26 - when I publicly declared Jesus as Lord and Saviour. When I repented of my sin and asked Jesus to be Lord and Saviour of my life, at the age of 26, I accepted forgiveness, I knew I was a 'new creation', and I knew I had been made right with God...but, I never realised, until a couple of days ago, that I was returning to God at the age of 26 after wandering in the wilderness for nearly 20 years - and I had committed a lot more sin during that time than I did in these last 5 years. These last 5 years was more a case of having grown weary of doing good, and of allowing my heart to grow cold. During the other 20 years I aborted my child, committed fornication, stole, and many other things. You could say I broke the Ten Commandments good and proper - and that while being His! Yet, as soon as I turned back to God and repented He instantly forgave me, instantly cast my sins away, instantly picked me up, dusted me off, and helped me start again. And I had accepted His forgiveness, not realising I had been 'backsliding' all those years; not realising that I had been His all those years. And He recently pointed this out to me, showing me "If I can forgive you 'all that', I can forgive you 'this'." So, I opened myself a little more to His forgiveness. But still, I hadn't abandoned myself to grace, as He is now calling me to do. 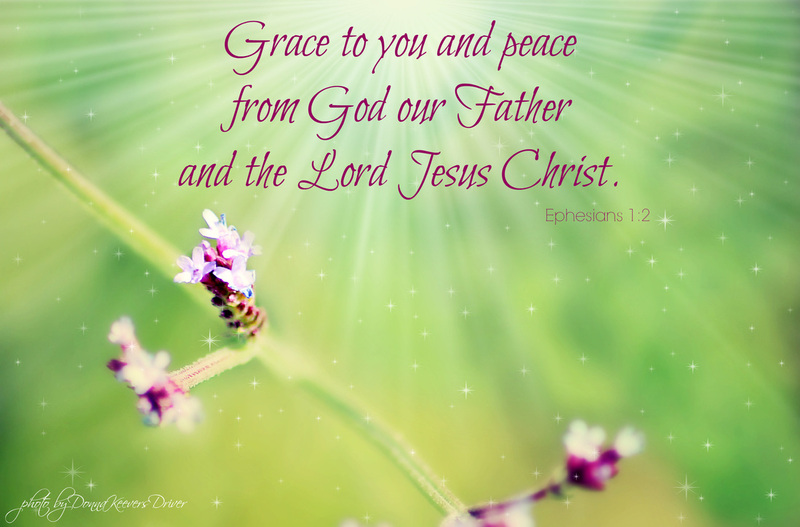 Grace: Undeserved favour from God...that is offered through Jesus Christ... How great is that. Reflecting upon this yesterday - two days after God said "Abandon yourself to grace", I realise my life story is one of grace. I can now look back and see God's grace all over my life. I am in awe of Him and His love. Also, upon viewing this yesterday, I had an image of grace being like an ocean - or space, more like, with nothing to land on - and I lifted my head, closed my eyes, opened my arms wide and, with peace, fell backwards, into grace, knowing nothing or no one but God would or could catch me. And oh, the peace I felt. Oh, the freedom. Oh, the joy... Freefalling into God's grace. But, again, it's a challenge for me to take it and keep it when I have a terrible habit of berating myself. And God's called me to take that challenge. I want to record that challenge here, on my website - hoping it will help someone else, and trusting it will bring glory to God and to Jesus - as the Holy Spirit desires to. God started my challenge with Day 1: Abandon yourself to grace... No taking on guilt or shame. No berating self. Day 2: Applaud yourself for your efforts...without letting go of Day 1. Day 4 will be: Walk in faith: Believe in all of God's promises. No doubting. Day 5: Give. Look to give - be it a gift, encouragement or praise. And I know God will use this challenge to set me free in many ways. He will cause me to accept the full measure of His grace, and He will set me free of the negativity I habitually throw at myself. It's time I stopped trusting my feelings and my opinions over God's love and truth. It's time to toss out this false idol (self :) ) and welcome God back onto His throne.